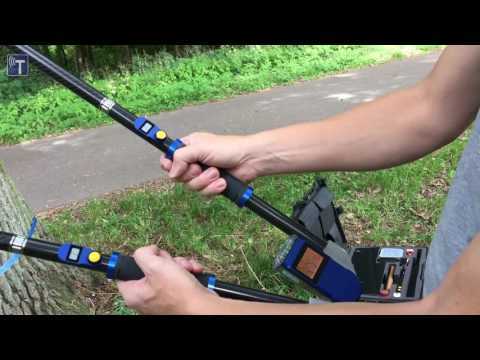 The PiCUS Sonic Tomograph is used for tree risk assessments in order to measure the thickness of the residual wall of trees with internal defects such as cavities or decay non-invasively. Most often the PiCUS sonic tomograms are recorded near ground level of trees. However, acoustic tomograms also reveal important safety information about the breaking risk near branch wounds and above ground cavities. The PiCUS Tomograph measures the velocity of sound waves in wood in order to detect decay and cavities in standing trees non-invasively. The acoustic velocity depends on the modulus of elasticity and the density of the wood itself. Most damage and disease causes fractures, cavities, or rot and reduces the wood’s elasticity and density. The sketch displays the basic working principle, in that sound waves cannot take a direct path through the wood (red dotted line) if there is a cavity between the transmitter and receiver. The acoustic waves are created manually with a little hammer, sonic sensors (receivers) record the signals. Little pins are used for coupling the sensors to the wood. Number and positions of the test points are critical to the accuracy of the scan. By using both acoustic travel-time information and geometry data of the measuring level the software calcualtes tomograms that show the apparent sonic velocities, thje so called sonic tomograms acoustic tomograms. The speed of sound in wood correlates with wood quality and is therefore a measure for the breakign safety of the trunk. The PiCUS sonic tomogram shows the residual wall thickness. Using this information the calculations on the web-site www.treecalc.com can show the breaking safety of the trunk. The cirmcumference and outline (shape) of the tree determine the number of measuring points (test points) for a PiCUS sonic scan. The PiCUS technology differentiates between sensors and measuring points (MP). A MP is a simple nail. For a PiCUS scan a virtually unlimited number of measuring points (nails) can be used because of that technology. The photo below shows a setup of 12 sensors on 24 MP. The electronic hammer can create sonic signals on all 24 MP, regardless of whether a sensor is currently attached to the nail or not. The photo shows a possible sensor distribution during a scan of a 24 MP tilia tree using 12 sensors of a PiCUS 3 system. The PiCUS Sonic Tomograph 3 can be equipped with 6 or 12 sensors. Respectively 6 sensors are assembled to a sensor cable loom. The PiCUS is shipped in a ruggedized case that contains everything that is needed to carry out the sonic scan: nails, hammer, number tags etc. Even the PiCUS Calliper version 3 can be (optionally) integrated into the measuring kit. The PiCUS is therefore the most compact sonic tomograph we ever built. The PiCUS sonic tomography scan is carried out like shown below. An introduction video can be found here. The measuring points, simple roofing nails, are set in the valid measuring level according to the visual observations. At least 9 measuring points should be set. Upwards, the number is not limited, but the minimum measuring point distance should not be less 12-15 cm. Each measuring point receives a number and at least the device is attached to the tree. Recording the geometry can happen in several ways. The most accurate and fastest method is triangulation using the PiCUS : Callipers. Even complex geometries can me recored accuratelly within munites. If the TreeTronic is used in conjunction with the PiCUS Sonic Tomograph, the geometry can be imported from the sonic data file. Tapping should happen on all measuring points, regardless of whether a sensor is attached to the nail or not. To tap constantly and gently is important. The PiCUS Software calculates 2D tomograms that show the mechanical stiffness of the wood - or strickly speaking the ability of the wood to transmitt sonic waves. The tomogram allows to measure the residual wall thickness. All tomography levels recorded on the same tree can be assembled to a 3D graphic of the tree in order to show the vertical extend of the internal defects. The latest manual of the PiCUS Sonic Tomograph is here. Please also read this pdf to learn about examples and the combination of Sonic Tomography (SoT) and electric resistance tomography (ERT - TreeTronic). Short English overview about the operation of the PiCUS Sonic Tomograph 3. Detailed English tutorial of PiCUS Sonic Tomograph 3, PiCUS caliper 3 and PiCUS PC software version Q74. How to use more measuring points than sensors, how to record the geometry and more. 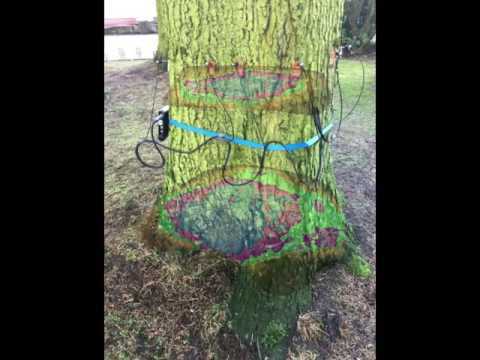 This video shows how PiCUS tomograms can be merged into photos of the tree.